MediVisuals, Inc. designs and develops visual exhibits to support medical expert testimony. We have more than 29 years of experience in working with the medical legal community including attorneys, paralegals, legal nurse consultants, and testifying experts. Our primary services include complimentary consultation, research and production services for medical illustration / graphics, medical 3-D models, animations and interactives. MediVisuals employs the country's largest private staff of professional medical illustrators and animators, and works with clients in all 50 United States and territories, Canada and other countries, from its two regional offices. Our specialty is personal injury and medical malpractice litigation. 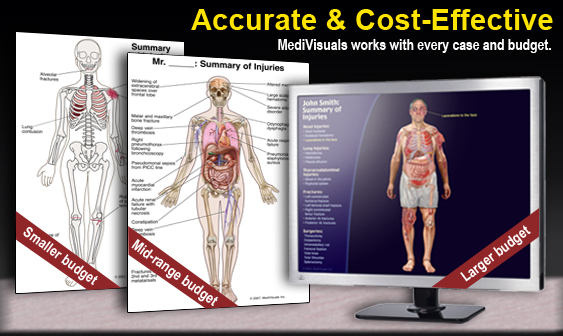 MediVisuals also supports textbook/journal publishing, and medical device/pharmaceutical advertising. As the nation's largest medical demonstrative evidence provider, we have assisted our clients by providing accurate and high quality medical exhibits for litigation. We have researched and illustrated various topics within all areas of medical science, creating demonstrative aids for personal injury, medical malpractice, and product liability cases for both defense and plaintiffs' attorneys. Contact MediVisuals for an immediate and intelligent response to your case needs. You and your client will benefit from our knowledge and experience in medical demonstrative evidence.